Chinese snuff bottles have long captured the imagination of Western collectors. Generalist appraisers frequently come across snuff bottles and even entire collections of dozens or hundreds of bottles while working because they were very popular to collect in the 19th and 20th centuries due to their mobility and small size - fitting comfortably in the hand. The purpose of this article (in three installments) will be to share strategies to assist in the accurate appraising of these petite, exquisite bottles, created to hold powdered tobacco, also known as snuff. In the process, the reader will learn the history of how they came to be created in China, as well as about the current market, dating, materials, shapes and connoisseurship. The use of snuff was already widespread in Western countries, and there were many famous snuff takers in European royal families throughout history, such as Queen Charlotte of England. Other famous snuff takers include Wolfgang Amadeus Mozart, Charles Darwin, Napoleon Bonaparte, and Abraham Lincoln. The stimulating effects of nicotine were both appreciated and addictive, and many were known to have stockpiles of various blends and consume tens of pounds of the powder each year. HOW DID THE SNUFF BOTTLE FORM EVOLVE? Initially, snuff arrived in China in small boxes made in Europe for snuff users there. The example to the left possibly belonged to Empress Elisabeth I of Russia, whose image decorates the inside of the lid. However, this shape was not compatible with the humidity of Asian countries and so the Chinese switched to using small bottles with narrow necks and added stoppers/caps to keep the snuff powder dry and preserve the aroma. The small bottles without corners could also be more easily carried by hand and in the pocket. The fourth Qing Emperor, Kangxi, established an Imperial glass atelier, which was supervised by a German Jesuit missionary, Father Killian Stumpf (1655-1720). In the early 18th century, influenced by the Jesuit missionaries who were skilled in the arts of glassmaking and enamelling, there was a tremendous increase in glass snuff bottle making. Ironically, the first bottles made in the new Imperial glass workshops imitated various types of precious stones and porcelain. The pinnacle of artistic technique and achievement is considered to have taken place during the reign of the Qianlong Emperor (1736-1795 AD). Bottles made in the Imperial workshops typically command the highest prices at auction, no matter the material from which they are made. After the end of the Qing dynasty in 1911, the use of snuff declined dramatically in Chinese society. The first step in appraising a snuff bottle is identifying its material(s). 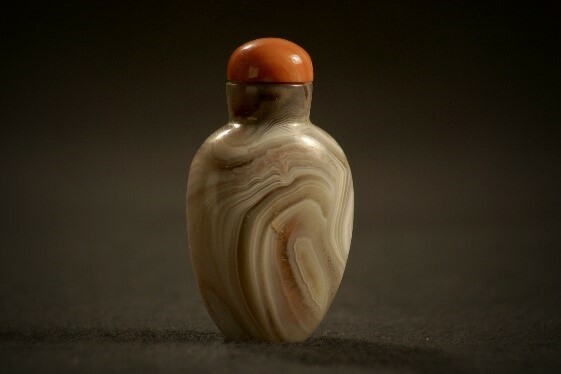 Snuff bottles are made from such a wide variety of materials (both man-made and naturally occurring), that this is not actually always an easy task. Typical materials include glass, lacquer, metal, jade, ivory, and a rainbow of colorful gemstones. Being able to correctly identify the material is often the greatest challenge facing an appraiser. Once the material is identified, other factors such as age, shape, condition, quality of decoration, spoons and caps, and provenance, that contribute to an estimate of value for specific appraisal purposes are usually more straightforward. Photo credit: Collection of The Corning Museum of Glass, Corning NY. Bequest of Marian Swayze Mayer , 86.6.58. Monochrome; painted (outside or inside); cameo or overlay; mottled; imitations of other stones. This bottle is an exquisite example of overlay/cameo glass at its finest, featuring a white primary layer encased with a layer of contrasting green glass that has been carved in high relief with leaves and vines on the double gourd-shaped body. Even its cap/stopper is made from a matching green carved glass to complete the theme. Such a bottle would most likely date to the late 19th/early 20th century, Qing dynasty (1644-1911 AD). Monochrome; underglaze decoration; molded or carved design; overglaze decoration; pottery/stoneware. Thousands of blue and white underglaze-painted porcelain snuff bottles were made over the centuries. Many of which feature outdoor figural scenes as these two do. Both examples have coral caps/stoppers, traces of snuff, while one has a very old metal spoon. They also both share traces of red enamel paint. One bottle features a red wax custom mark indicating that it is not deemed to be a national treasure by Mainland China’s custom department and could therefore be exported. Jade; quartz-crystalline: rock crystal, rose quartz, amethyst, smoky crystal, hair crystal; quartz-cryptocrystalline or chalcedony: agate, carnelian, jasper, moss agate, sardonyx, onyx. This pebble of white jade features a pale orange ‘skin’ on its sides, and a purple amethyst cap in the shape of a stem to complement the fruit shape of the bottle. 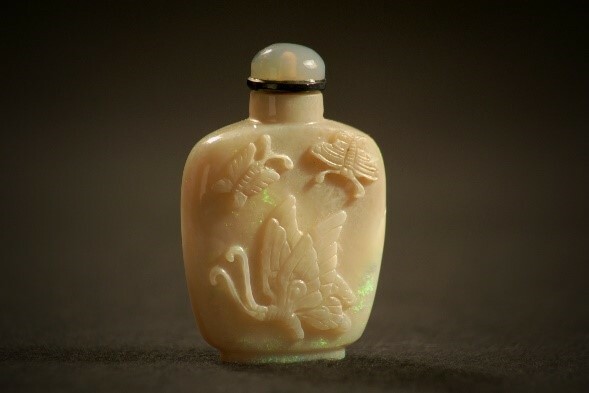 There are two types of jade - nephrite and jadeite - and this bottle is an example of white nephrite; a color which the Chinese consider to be particularly desirable by a connoisseur and from a monetary value perspective. It is also an example of a jade carving technique called “qiaodiao,” which means “to adopt the most suitable design,” referring to the way the artist incorporated the nature material so as to maximize the orange-colored inclusion. It possesses a beautiful patina from years of being held and admired in the palm of a hand. Amber; coral; horn (rhinoceros, buffalo); ivory; jet; mother-of-pearl; tortoise shell; bamboo; wood; lacquer of various types. Dating from the mid-19th century, and made from red cinnabar lacquer, this carved lacquer snuff bottle was made by craftsmen applying multiple layers of laq. 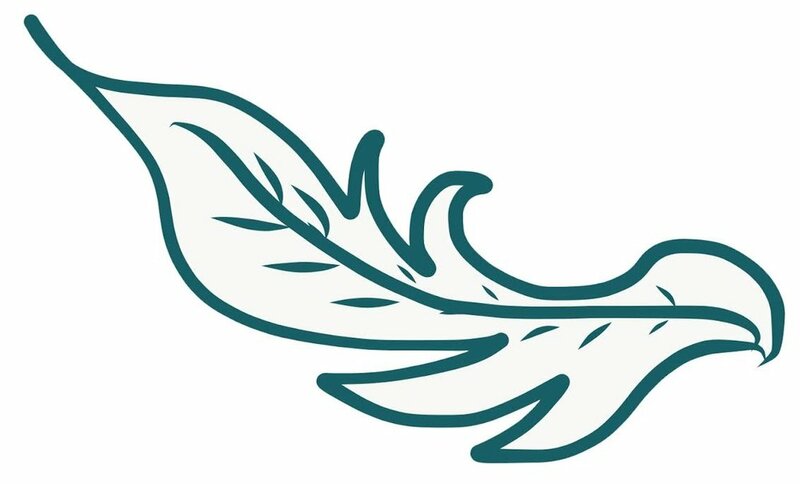 It features the phoenix (sometimes described as the ho-o bird or feng huang). The lacquer would have been put on a wooden core in a process that requires many coats, with drying time between each. The quality of an object of lacquer can often be identified by the depth of the carving, because high relief required more time and work to create. The stopper and spoon (ivory stained red), in this case are not original to the bottle, as is the case with many snuff bottles. Enamel, metal, embellished, such as cloisonné, silver, gold and bronze, etc. Many more examples of snuff bottles in a variety of media will be examined in Part II of this article, which will also discuss bottle shapes and terminology, spoons, as well as the most common art motifs and symbolism used for decoration. Part III (final Part) will discuss the current market of snuff bottles, famous collections, record sales, and resources for researching and snuff bottle connoisseurship. Susan Lahey, MA, ISA AM is the President and Asian Art Specialist at Eastern Art Consultants. Learn more about her services at www.easternartconsultants.com | 647-283-8984 | susan@easternartconsultants.com. International Snuff Bottle Society website. The referred to as a starting point which I have streamlined is found in Bob C. Stevens’ The Collector’s Book of Snuff Bottles, p.33-39. Marian Swayze Mayer was a founding Fellow of the Corning Museum of Glass. Definition is borrowed from the glossary found in www.Gotheborg.com.